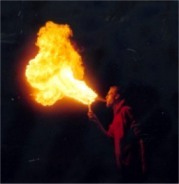 Fire breathing is one of the most dangerous of fire arts to the extent were it can kill you. Through either ingestion of fuels, which can cause severer health problems to organ failure. To blow backs. 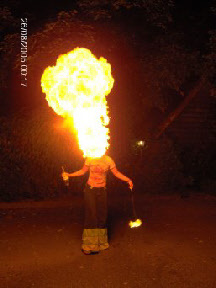 A blow back is when the fuel ignites and the flame shoots backwards and goes into the mouth. 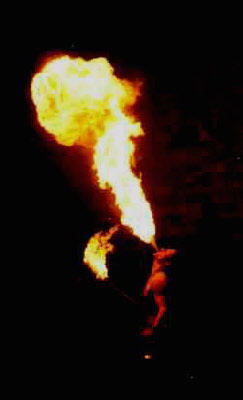 This causes the flame to go past the mouth and into the lungs, which is fatal. To flash backs when the ignited fuel gets pushed back at you, covering you with ignited fuel through the wind changing direction. Up to 3rd degree burns all over the body. 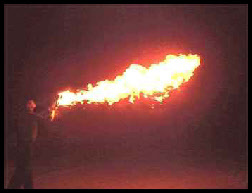 To anyone wishing to learn fire breathing. 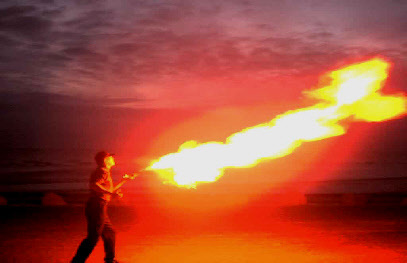 Get taught by a professional fire breather. Do not try and learn it from a web site this is a highly dangerous art, I spent years practicing with water before even trying it with fuel.ire breathing without professional training. 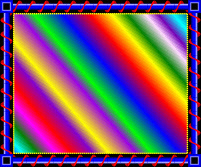 Are you a Juggling artist or performer who uses Glowsticks, Glowstick Liquid Rave Dance, Twisters, Nunchaku, Poi, Spinning, Staff, Twirling, or Fire, and uses Dance Music with their Art and would like a link or a disabled artist who has an art or entertainment site that has Tips, Videos, Photos and would like a link. Click on Add your Link.